The Light Source 012LS consists of two different light sources – white LED and UV LED (400 nm). A switch located on the top of the device allows choosing the light source: White or UV. This Light Source is designed for use with the CMA Spectrometer 012 for measuring Transmission and Absorption spectra of various materials. 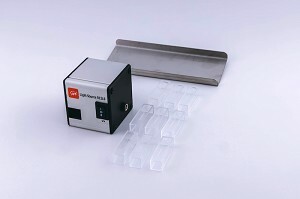 It has a built in cuvette holder, which is suitable for standard cuvettes for liquid samples or in which small solid materials can be placed. Ten standard cuvettes are included and a metal guiding rail is provided with the Light Source for proper positioning when working together with the Spectrometer. More technical specifications about Light Source can be found in its User's Guide.